S. Bosse, VAMNET: the Functional Approach to Distributed Programming (Article), SIGOPS Oper. Syst. Rev., 40, pp. 108-114, 2006, DOI:10.1145/1151374.1151376. This article gives a design overview of a new reliable distributed operating system environment, combining the world of functional and distributed programming using a virtual machine approach for hiding system dependencies, offering rapid prototyping facilities. The basic operating system concepts used are derived from the Amoeba operating system by Andrew Tanenbaum and his work group, developed 20 years ago. VAMNET is not only a native operating system. It is a hybrid solution for expanding widely used operating systems like UNIX with a distributed execution environment. Dirk Spenneberg, Stefan Bosse, Jens Hilljegerdes, Andreas Strack, Heiko Zschenker, Control of an Bio-Inspired Four-Legged Robot for Exploration of Uneven Terrain (Proceeding), Proc. of ASTRA 2006 Workshop, ESA-ESTEC. Noordwijk, NL, 2006. This paper describes the four-legged ARAMIES robot which was built on the experiences gained with a first integration study. It describes the revised mechanics. The new modular electronics low-level control concept is presented and the developed FPGA-based joint control is explained in detail. Furthermore an overview on the software control approach is given and the new ground contact detection module using an IR-sensor is explained. S. Bosse, The VAMNET Book - The Virtual Amoeba Machine Environment, AMUNIX, and the VX-Amoeba System (Book), BSSLAB, 2005. The VAMNET is a hybrid operating system environment for distributed applications in a heterogeneous environment, concerning both the hardware architectures used and operating systems already present, for example the UNIX−OS. The VAMNET consists of several parts. Some of them can operate standalone. All of them build up a hybrid distributed operating system environment. Fields of application 1. Distributed measuring and data acquisition systems, for example remote digital camera servers connected with an ethernet network equipped with digital imaging software. 2. The native Amoeba kernel is very well suited for embedded systems, like PC104 single board equipmment. 3. Distributed systems for machine control. 4. High performance parallel computing and other distributed numerical computations. 5. Distributed filesystems on the top of standard operating systems. 6. Distributed remote (wireless) robot control. 7. Educational tool for the convinient study of distributed services and operating systems. Advantages of a hybrid system 1. The basic concepts of the distrubted operating system Amoeba are avialable with common operating systems with a convinient desktop environment. New operating systems mostly lack of actual device drivers, especially on the i86−pc platform with a wide spectrum of available hadrware. 2. For specializied (perhaps embedded) machines, for example data acquisition systems, or hadware device reduced numeric cluster machines, the native Amoeba kernel is the best choice, featuring a modern and clean microkernel, and exploring the power of the Amoeba system. 3. Both worlds, embedded and specialized computers and desktop computers, can be merged with simple but powerfull methods and concepts using a hybrid system solution. Each machine gets the system which fits best. S. Patzelt, S. Bosse, G. Goch, Laser optical surface characterization of complex optical elements in the nanometric range (Proceeding), Proc. of the 4th euspen International Topical Conference, Aachen, Germany, 19.-20.05.2003, S. 519-522., 2003, ISBN: 3926832304. S. Patzelt, S. Bosse, G. Goch, Surface characterization of optical elements based on monochromatic scattered light techniques (Proceeding), Proc. of the Sensor 2003 – 11th International Conference, SENSOR Proceedings, B8.3, Nürnberg 2003, S. 305-310. Surface roughness in the nanometric range represents one of the key properties of high quality optical elements (lenses, mirrors, replication tools and molds). Besides the roughness local defects (scratches, abrasions, pits, cracks and chips) influence the optical functionality. Furthermore, in the case of structured surfaces, pattern deviations (e.g., insufficient periodicity) affect the structure function. In general, such surfaces are characterized with conventional measuring devices, like tactile profilometers, white light interferometers, confocal microscopes, scanning force microscopes, or near field acoustic microscopes. They measure the surface topography in detail and calculate roughness parameters from the measuring data. The surface assessment of optical components is also part of the Transregional Cooperative Research Center SFB/TR4 "Process Chains for the Replication of Complex Optical Elements" funded by the DFG (Deutsche Forschungsgemeinschaft). One objective within this research center is to lay the scientific foundations of microtopography characterization for a deterministic and economical mass production of optical elements with a complex geometry. As the elements are used to shape optical beams, the investigations focus on optical measuring methods. In the case of mass production the measuring methods for both the production tools (e.g., molds) and the products should additionally be capable of in-situ measurements or even in-process measurements. Laser measuring principles based on scattered light and speckle correlation processes are suitable for this task. Scattered light techniques are generally parametric, i.e. integral roughness parameters like Ra and Rq (ISO 4287) can be extracted directly from one measurement without reproducing the 3D-topography. The view field dimensions are in the millimeter range. Therefore, scattered light techniques ensure the required short measuring times and high clock rates, i.e. they show in-process capabilities. 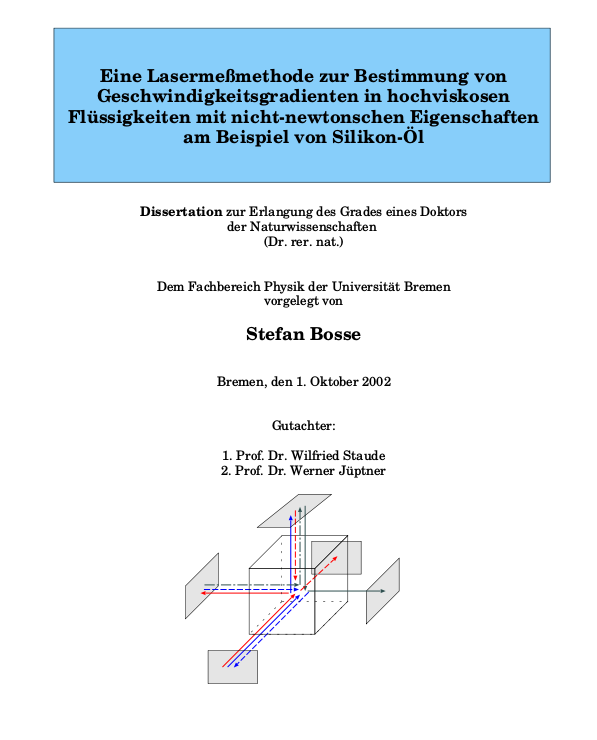 S. Bosse, An experimental Laser light-scattering method for measuring velocity gradients in non-newtonian fluids with high viscosity (PhD Thesis), University of Bremen, Bremen, Germany, 2002. The goal of this PhD thesis was to study local velocity gradients, i. To investigate local velocity gradients of viscoelastic fluids using different types of flow with a laser scattering optical method. From the measured velocity gradient components, conclusions are to be drawn on the expected non-Newtonian behavior of these highly viscous fluids and compared with the models used in rheology for non-Newtonian fluids and analyzed. Furthermore, the suitability of the light scattering method used is to be investigated and the limits of its possible uses to be demonstrated. For measuring individual gradient components of the local velocity field in the flowing fluid, which may be variable in time, or a linear combination of these, a double pulse optical pulse scattered light method (double pulse strophometry) is applied, which is characterized by ease of use and manages without explicit calibration. This method was originally used to measure velocity gradients in laminar and turbulent water flows. In this measuring method, the scattered light of a pulsed laser beam of scattering particles contained in the liquid is picked up by a one-dimensional or two-dimensional light detector. Most commonly used are CCD detectors (Charged Coupled Device Cameras). S. Bosse, W. Staude, Measurement of rotation and distortion of opaque surfaces by laser light scattering (Article), Meas. Sci. Technol., 11, pp. 1557-1564, 2000. We present an experimental method to measure velocity gradients caused by distortions and rotations of arbitrary light scattering surfaces. The method is sensitive, gauge free and has a fairly high resolution. It is based on the scattering of coherent plane light wave at the surface and the evaluation of the intensity pattern of the scattered light in the far field by use of a CCD-camera. By proper choosing the scattering geometry one can measure definite components of the velocity gradient of the surface.